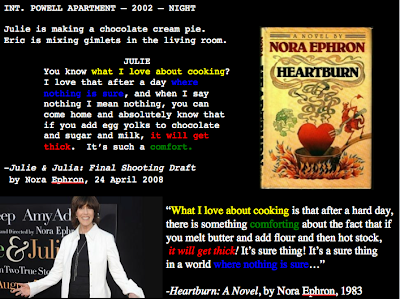 Basically, all you need to know is that Nora wrote a nice little "What I love about cooking" paragraph in her novel, Heartburn, back in 1983 and and she reworded it slightly to fit the "chocolate creme pie" scene in Julie & Julia. Personally, I thought this was kind of lazy, but whatever--I'm just a guy who has seen this movie way too many times. 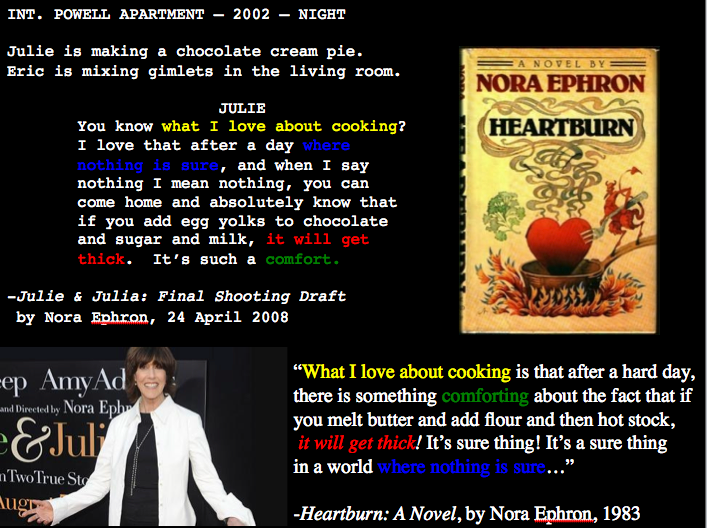 It was startling then to learn today that in fact, Nora Ephron's been using this same stupid bit to coast on through to success and respect in the culinary world. Don't believe me? Well my friend Audrey found this little intro blurb in the "Stocks and Sauces" chapter of her Culinary Theory and Practice textbook. BOOM! THE EXACT SAME QUOTE. IN A TEXTBOOK ABOUT COOKING. WHAT QUALIFIES YOU TO BLURB THIS STOCKS AND SAUCES CHAPTER, NORA EPHRON? WHAT???? YOU ARE NOT A REAL CHEF LIKE JULIA CHILD OR MARIO BATALI! YOU ARE SOME OLD BLOWHARD! Sure, the whole thing carries a nice little sentiment about cooking and stability, but dammit Nora--COME UP WITH SOME NEW MATERIAL. Julie & Julia Quote of the Day: "Dear Avis, enclosed is part of our cookbook from the chapter on sauces." It's just amazing how day after day you find the perfect quote to fit with whatever you're writing about. A new totes may entirely certainly be a solid add on even so realize it while in the inappropriate contours, sizes, louis vuitton replica as well as styling plus don it inappropriate nevertheless it would possibly without doubt ruin the look that you try and tug. fake chanel Even though it is definitely founder bags along with totes we've been in addition talking with regards to, chanel replica sale a new hooks pay a visit to often even bigger. chanel replica sale Effortlessly, your current founder totes are not a little something anyone spend on along with there after eradicate 1 time these people disappoints. fake chanel Your satchel developer luggage may be popular along with can even be proficient for a in close proximity to versions as well as loved ones. In addition, these kind of developer luggage correctly go with using many expressions. How far would you like to go? On the off chance that you reply, "not far," don't stress on the grounds that there are huge amounts of incredible spots to drive an auto contract that are in closeness to Milan. Attempt Como, Varese or Vigevano to appreciate a look at conventional Italy.